2014 dev Update #6: Start Devlog 1! 2014 Dev Update #5: Forests, Backer Sidequests/NPCs/Gravestones, Concept Art! 2014 Update #4: Backer Sidequests, NPCs and Gravestones, Timelapse Vid, Concept Art! 2014 Update #3: Dev Update, Merchandise sent, More Concept Art! Hello ladies and gents! Our last update was kind of a downer in general considering all of the trouble we went through to get to this point. Let's see if we can turn that frown upside down! Wow, that sounded terrible. Not saying that again. Anyway, let's start with some new eye candy! Having a faulty computer from purchase is one thing, but it's a whole different ordeal when a computer you've used for so long has died. Computers seem to have the lifespan of a rat in this technologically evolving society. Nevertheless, when you do spend so much time with computer, you get attached to it and it's difficult to see it degrade into one that seems to have dementia. Tegan, our sprite artist recently had her workhorse laptop die on her. For the past several weeks her laptop decided it no longer needed to register half of her keystrokes. Unless she had access to another computer, communication was relegated to broken english or leetspeak (l337$p34|< yo). Tegan: "ill o a muh ok a i an a hool"
Tegan: "ILL JU ..... ALK 2 YOU @ hool"
Me: "Ah, alright talk to you later." Tegan: "ok ju$7 ecidig be7ee ju$7 doi $oldier or 7empa7e"
In retrospect, it was kind of fun. For me, at least. Luckily all that has been taken care of and she's been upgraded to a new built-it-herself desktop. This time around, we have nobody to blame (*cough*wacom*cough*) but ourselves if something goes wrong! Yay! At the peak of his military career, Gareth Lawton was a trusted first lieutenant of Leon Hightower within the Valian Army. Everything has been business as usual for Darren our musician and Drew our lead programmer. We're looking to add another programmer to our team in an effort to speed up development. Vagrant now has a fully functioning Cintiq Companion, despite the ugly cord drilled from the back end of it to make things work. New environments are in production as we speak opening me up to work on other parts of the world. Apart from fleshing out the rest of the world of Cielo'viv, I've been retouching Enemy AI (Guards within Port Nasbeth Jail) and working on puzzles and mechanics to finish off this segment of the main storyline. Although I scheduled polish to be applied at the end of development, I decided to do some within the jail and work on lighting and effects to see how it would turn out. Considering how dark the jail is, it looks great and adds a significant amount of depth to the visuals. Darkness and light will also play into some key moments of this segment in the game. I've also fixed some glaring issues with customer movement within the Run a Shop portion of the game. There always seems to be some kind of 'woe' in these updates. This past week and a half I've had to deal with the forum suddenly breaking itself. Some of you who frequently check the forum have noticed that it was down for a number of days. If you've just tuned in, you'll also notice that it looks and functions quite differently. This is due to the fact that I had to change forum software and convert/import the old database into this one to solve the problem. It didn't really solve the problem, we really just sidestepped it. The previous forum was SMF, and we've moved to phpBB. You'll notice old posts may not be formatted properly and posting will be quite different. We've lost the WYSIWYG interface to preview the post while we edit it, but I believe the change is better overall. Private Messages are no longer per-message but in threads, so it's much easier to track what has been talked about. To see the latest posts, simply hover over the "Search" dropdown on the upper left and click on "View New Posts". For anybody with active phpBB experience, if you could direct me to a nice WYSIWYG add-on for posts, it would be a great start. Remember that you will have to reset your password, since passwords were not imported from the old forum! Casting call #3 is up in the forum! Nasbeth Jail is one of the largest prison systems in Cielo'viv. It was 'renovated' from an old Kobold dungeon system and built upon into a modern, mechanized jail with some advanced security measures. The more sinister criminals spend their time in the darker recesses of the dungeon. Port Nasbeth guards are known to treat everyone equally. That is, they treat all criminals and well-mannered citizens the same, so don't be surprised if you spend a couple nights in this jail. "A young, selfish bounty hunter mistakenly endangers those he loves most while exploring the dark secrets of his own past." Another friend of ours has relaunched their Kickstarter campaign! Broeder: The Secrets of Ohr is being developed with a lot of love and attention to detail. Check it out! Hello ladies and gents! Don't call me out on how long it's been since the last update. Two months! Yes it's been a long time. While I'd prefer to tell you that we've gotten so much done during that time, things just never seem to go according to plan. There has been a lot of progress, but I feel that I should explain the troublesome situations the team and I have found ourselves in. From here on out, Kickstarter and forum updates will read more like developer logs. It probably won't be that much different from the previous updates, just with more text and possibly less screenshots. Everyone knows Wacom is the holy grail when it comes to digital art. Nobody told us they were just one of thousands of tech companies that could make a highly defective product and sell it at a discount in the hopes of avoiding the situation sega and the creators of the E.T. video game found themselves in. Yes, I would like to take this moment and rant about their overly ambitious and highly not-worth-it product the Cintiq Companion, a product that has cost us at least a month of development. Around February, Vagrant, our highly skilled environmental pixel artist's computer began to malfunction(die). He was traveling around Europe at the time (and still is) so we decided it was time to upgrade his work station. We had two options, a Surface Pro 2 which was more than enough for the job (and in hindsight definitely the product we should have settled with), and the Cintiq Companion, what we both considered to be the best option for an artist. It was at a $300 discount at the time so it was a no brainer, despite still being considerably more expensive than the Pro 2. After inspecting the product myself and sending it to him in Spain (wherein customs effectively nullified the discount of buying it in the US compared to Europe), he got to work happily with his new workstation. Several weeks later it became more and more difficult to charge the unit. Vagrant needed to fiddle with the charger for a few good minutes just to get it to start charging. A few minutes became tens of minutes, at one point becoming an hour. Further research on the Wacom boards would have told us that the issue was common with the Companion, with many owners having to return the unit more than twice to have the issue resolved. This was impossible since the warranty only applied to the U.S, and sending the unit from there was immensely costly. Vagrant had to get a custom PC specialist in the area to make (yes, make) a new cord so that it would charge the unit. This temporary fix proved very temporary, as it again began to stop charging the unit. Now he's opted to have the charging cable and plug replaced with a magnetic charger, the same type you can see utilized in macbooks and the surface tablets. This whole dilemma has caused his work to get pushed back by at least a month, causing the rest of development to slow. Needless to say, this whole experience was a huge learning experience. When in doubt about a product that could potentially lose you precious time and money, always do more research. Now that that's out of the way, maybe a small update on actual work would help. Tegan our main sprite artist has been hard at work finishing the various sprite generators to be used in the game, and our Annoying Follower Tier backers. She's also been working on the sprites of various items that Petula will be selling in her shop(s). Darren our musician has been hard at work making ever more awesome tracks for the game. Here's one that will be showing up in Nasbeth Jail, located in Port Nasbeth (duh). Drew our lead programmer has been hard at work doing what he does best, writing mundane lines of jibberish that always seem to make the game better. Vagrant has been doing his best to get some work done when he gets the chance. Hirei our bust artist has been away on leave. She's preparing for a local convention that she'll be paneling her artwork at. She'll also be a guest speaker! Because of the lack of new environments, I've had to settle with working on later stages of the game that use previous graphics, NPC AI and the mechanics of running a shop. The engine we're using (RPG Maker VX Ace) was not built around the mechanics that we've developed for it. Because of this, we have to do a lot of optimization to make sure that the game runs at a high enough framerate so that it's playable and enjoyable. I've been optimizing the NPC AI, in particular the way hits are registered between the player and another NPC Enemy. No, you won't be hacking and slashing with a sword as Petula, it just means that there are reasons for you to swing something (like a shovel) at something or someone else. We'll have multiple shops available for Petula to run including her main shop. I found myself having a lot of fun playing the demo. It was amazingly well polished and it gave me a lot of insight into how a simple system can be so successful. Regardless, I would like to keep that level of complexity we've established in the beginning. For all of our backers who are still looking for a place to put their NPCs and gravestone messages, please be patient! I promise I'll have more information for you guys before the end of the month. If I don't have any information by the 24th, you have my express permission to incessantly bug me about it until I release it! For our Forest Hermit backers, please contact me at your earliest convenience either here, on the forum or on Steam! We should figure out what you want to do with your maps, NPCs and sidequest ASAP. "A collection of paranormal experiences, true ghost stories, friend-of-friend tales and brushes with the unknown." My good friend Karen has contributed to this fantastic looking anthology, and I think it deserves to be funded! "Explore a desolate world of danger and deceit; solve ancient puzzles and defeat the countless hordes of foes from another realm." A great looking project from a friend of mine, made with the same game engine! Darren is also taking part in this project, lending his beautiful rhythms. If you're looking for a more traditional action RPG to play there's nowhere else to look. "A 2D, story driven sci-fi fantasy RPG with a theme of discovery, and a comic based art style. Returning to the roots of JRPGs." Another great looking project from another friend of mine, made with the same game engine! The art is fantastic and absolutely refreshing in this genre and it's more than worth a look. "A post-apocalyptic adventure/visual novel hybrid inspired by Ace Attorney and Zero Escape games set in Japan." All I can say is this project looks beautiful! At over 100% funded it's not in danger of failing, but I decided you guys may want to check it out yourself. Don't forget to let them know we sent you! Hello ladies and gents! It's been over two weeks, so I'm a little late on our usual updating schedule, we've been very busy cranking everything into overdrive, and tax season has not helped one bit. For those of you who won a spot in the first two casting calls, please check your Kickstarter messages or forum PMs! I've already implemented a number of backer NPCs, though I'll need your attention and support to finish up these first batches of NPCs. This forest is first encountered during a linear portion of the game from the beginning. However, it'll be accessible again once the game becomes more open-world. This means that yes your quest can involve going out further into the world. The forest is made so that the player can easily get lost within it. The map(s) your quest will start in can be accessed if the player gets lost, but not if he knows how to get straight to the exit. Many of the forest maps have not been made so that I can tailor them to backer sidequests. You'll have some say in what the map will look like, but not the same control higher-tier backers get. Finally some more eye-candy concept art! 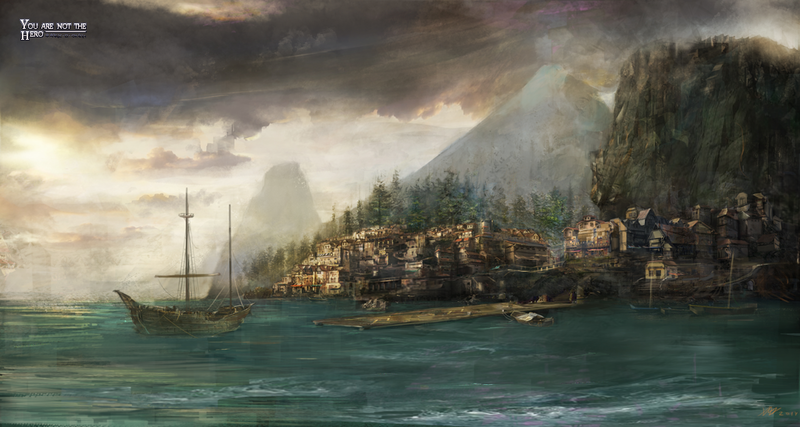 Port Nasbeth is a major trade city within the nation of Gillia. It's overrun by Enox soldiers and Gillian supporters of the war. A friend of ours who has helped in the creation of YANTH is currently holding his own Kickstarter campaign! Matt Beer's "Toby's Island" is a smorgasbord of creativity and interactivity. I wish I had his expertise on our project! Hello ladies and gents! Were back for another progress update and a backer awareness meeting of sorts. I'm reaching out to some of our very specific backers in an open update and showing off some more artwork. If you won a spot in the first casting call, your time is now! If you haven't gotten back to me yet, make sure to check your Kickstarter inboxes and get back to me on the forum! As for casting call #2 participants, your time will be very soon so please look out for any messages I send through Kickstarter. If you've backed the project for a gravestone reward, we've got some spots opened up in the very first town, Petula's own Hearth Village! Get to the forum and sign up for your gravestone. Unlike the casting calls, this is first come first serve! Please don't mind the running animation, it's still a WIP. These are accessible very early in the game, right after the first cutscene. It's possible that these sidequests won't be accessible later on. These sidequests will be constrained to the areas of Hearth Village only. Almost everyone in Hearth Village know Petula, so this may be the only chance to have a sidequest where Petula knows your characters ahead of time. Some mechanics will not have been explained yet, such as jumping, dashing/dodging and swinging, though it shouldn't be a problem. If you're interested and you are a backer of the Stuck in a Cave or Took The Red Pill tiers, please message me here or in the forum! If you don't follow our facebook or twitter, you may not have seen this yet. I've recorded a timelapse video of a map in creation early in the game using the new tilesets Vagrant is supplying us with. This map took an hour and 20 minutes over a span of three separate days to finish. The song in the background is by our very own Darren Curtis, a song you'll hear in the game. We've got some more concept art, this time from our bust artist/concept artist Hirei! She's given us some very awesome designs for soldiers. For those of you who have received your shirts or hoodies, come show them off! Here's a picture of the mother creature you may not have seen if you haven't followed us on social media. What do you think!? Share yours with us on our facebook or twitter! Check out this really awesome game currently being funded! It's very reminiscent of the Pokemon series in which you fight with monsters. They've got an open beta going on right now, and even featured Petula in the game! Hello ladies and gents! It's time for another update! First off are the results of the second casting call. Thanks to everyone who have participated so far! If you weren't chosen, don't worry because everyone in the correct tier is guaranteed a spot! 5 Nobles applied, and 1 secondary. There's a possibility of a second Noble on the train which may go to Jial if you verify within the next week. Otherwise, it will go to Nicon. 4 Train Attendants applied, and 2 secondaries. 8 Forest Hermits applied, and 1 secondary. 3 Soldiers applied, and 4 secondaries. Congratulations, you're now army buddies! Might want to collaborate with each other when the time comes. If you've been cast and you no longer want the position, please respond asap. 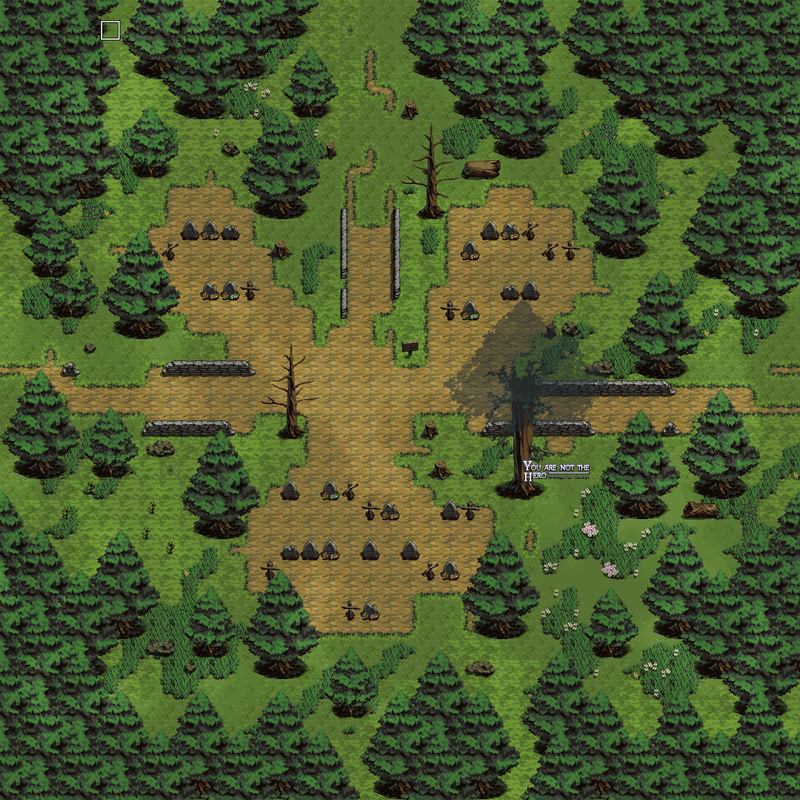 Marko has done it again, with the military camp in Greencliff Forest, the same place Nianaris and Tomzilla will be making their debut in-game! Yes, finally the T-Shirts and Hoodies have been sent! Some of those who ordered them may not have received their tracking number. If that's the case, please contact me here on Kickstarter. For everyone else, you probably received your tracking number a good 3-5 times, for which I apologize very very much! This update is for those of you looking for some news about the progress on the game itself. Drew and I have been working very diligently to get the game in an Alpha state. By that, we're getting all of the mechanics into a workable state so that we can move on to content creation. That's not to say content hasn't been started on however! Stephanie aka Hirei our bust artist has been working diligently on new bust art (which has been updated since we last introduced it) and character concept artwork. Xavier aka Vagrant, likewise has been working on new environmental artwork to make the game as pretty as it can be. Aside from working on, testing and debugging mechanics, I've been updating and converting the current chapters with new artwork and new mechanics, fleshing out and finalizing the main storyline and delegating work to all of the members. There's less than 24 hours left for the Unsung Story Kickstarter, and they could use some help! A tactical RPG helmed by the legendary Yasumi Matsuno of Final Fantasy Tactics fame, now is the time to show your support! It's no secret that FFT was a giant, almost singular influence on me becoming an indie dev and working on YANTH. Hopefully Matsuno can pull off another amazing game with Akihiko Yoshida, one of the greatest character and game artists in the industry, Hitoshi Sakimoto, a veteran composer that worked on FFT and FFXII, and Playdek on his side!